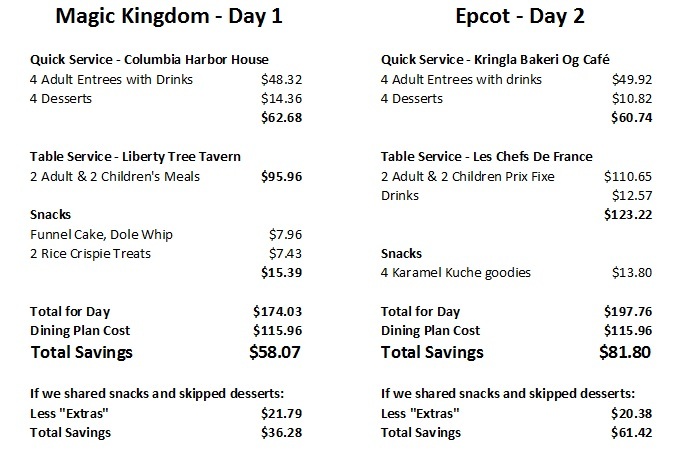 The Mouse Connection: Do you REALLY save money on the dining plan? To dining plan or not to dining plan...that is the question. Many of the families I work with are gung ho about signing up for the dining plan, and others are more than a little suspicious. Critics of the dining plan site its cost, the overabundance of food and not wanting to be “tied down” to dining reservations so far in advance. While all of that is absolutely true, I decided to wear the hat of my number crunching husband. I took the practical approach to see if the dining plan actually saved us money. Turns out, for our family, the dining plan is not only a winner, but a BIG winner. We opted to go for the Regular Dining Plan, often called “Plus Dining”, which consists on one table service meal, one quick service meal, and one snack per day for each night of our resort stay. This plan made the most sense for us because I like to have one sit down, relaxing meal each day. In fact, it is my favorite part of the day. I love to be face to face with the family and talk about what we loved, what we didn’t and what we are looking forward to the next day. After we order, I have been known to discreetly pull out the video camera and do a quick interview with the kids. I love hearing about the day in their own words while it is still fresh. I like the break, the “forced” time out from the world to relax and really talk. Another reason the dining plan makes sense for our family is that I hate nasty surprises. My thought going into the trip that I would either break even or come out slightly ahead cost wise with the dining plan (Boy was I wrong, I came out WAY ahead!). I signed up any way because I wanted to know exactly what our food costs were going to be. The husband I and decided that even if we ultimately spent a little bit more on the dining plan, it would be worth having as a sort of "insurance" policy. Also, I like to splurge a little on vacation and Idid not want to “settle” for the hamburger when I really wanted the steak. It was a good feeling knowing that meals were budgeted and paid for in advance. We could order whatever we wanted off the menu guilt-free….no surprises…no sticker shock. To be fair, the critics of the dining plan do have some reasonable points. If you have paid for so many table service meals, you want to make sure you use them, which requires dining reservations…which requires advance planning. 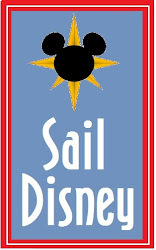 Of course, if you want to eat at any particular tables service restaurant, you will need a dining reservation whether or not you are on the dining plan! I also tend to plan most of my park days well in advance any way. While I do not necessarily believe in scheduling every second, I do not like crowds, so for most days I pick my park based on crowd levels…once I pick my park my dining falls into place. Assuming that you are going to eat one sit down meal every day, the most compelling argument against the dining plan is the cost and the “too much food” aspect of the plan. So I dutifully saved my receipts and crunched the numbers. I looked at the numbers in two ways…what I actually ordered vs what I would have paid and what I would have ordered if I were not on the dining plan vs what I would have paid. If I were not on the dining plan, we might have shared a snack instead of buying more to take home with us, we would certainly have skipped dessert at lunch, and instead of my husband and I both ordering dessert at dinner, we would have gotten one to share. I figured that I would have come out ahead on the apples to apples comparison, but what if I compared apples and oranges? What if I compared the cost of the dining plan to what I would have ordered as if I had to pay on the spot? 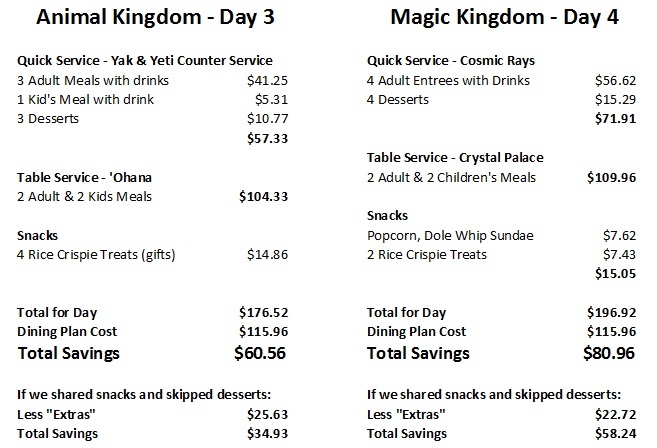 Would that 1 dessert and 1 snack for the family to share ultimately mean the dining plan cost us more than it was worth? Well...let’s see… I used our first 4 park days as an example since we ate one quick service and one counter service meal each day. I totaled up what we ate and subtracted the cost of the dining plan to see the savings. To be fair, I did order more than I would have if I were not on the dining plan so I subtracted out the “extras” that we would have passed if left to our own devices. So over our first four days, we saved over $280 on dining! If you subtract out the extras we still would have saved over $190! I must admit that I was really surprised at the savings. I honestly thought we would come close to breaking even or maybe end up getting out snacks “free” out of the deal. To be fair, if we were not on the dining plan, I might have chosen some less expensive restaurants. For example, I might have traded in Liberty Tree Tavern for the Plaza. I also may forced my kids to eat from the kids menu. But I am sure that I still would have kept some of my favorite higher end restaurants in the mix. Of course, some of those snacks that I subtracted from my end of day total went to buying rice crispie treats to bring back home as little gifts…so that savings would ultimately have been added back into my souvenir budget. For our family the biggest savings was a result of having children under the age of 9 on the dining plan and eating at buffet restaurants. The cost of the kids dining plan is $11.99. The cost of some dinner buffets is $14.99-16.99. So we came out several dollars ahead with just one meal! Also, Disney does not distinguish between adult and child counter service credits, so if my kids preferred something on the adult menu, I allowed them to order it. While Disney policy states that kids under 9 should order from the kids menu when available, every cast member when asked, allowed me to order from the adult menu for my kids. You plan to sit down and eat one meal a day. You have a budget that is important to adhere to. You have kids in the 3-9 age range. You enjoy eating from the "higher end" of the menu. You enjoy eating at "higher end" restaurants. And if all of the above are true - you are crazy NOT to be on the dining plan! 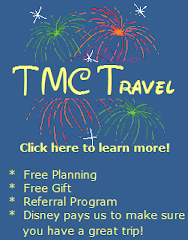 If I can help you with your vacation planning please contact me at TMC Travel or by email. As always there is no fee for my services! Great idea to break it down for everyone like that! You can really SEE the savings! The trip I just got back from was my first on the dining plan. I really think it worked wonderfully for my family. I have a lot of my receipts; I wonder if I could go back and figure up what our savings for one day would have been. Great info!! Oh, and I just found myself on your blog favorites list! What an honor!! Thanks for your wonderful inspiration!! We ALWAYS use the dining plan! The extras for us - the ability to use our dining plan to pay for Hoop De Doo, for example, make it more than worth it for us! And with a teenage son, it allows me the flexibility to meet his appetite! For us, it is DEFINITELY worth the money! We won't ever go to Disney without it! I just came back from the World, and looking at just the dinner bills alone--I knew that we were saving a great deal. My hubby really wants to do a sit down meal every day, and using the dining plan is the only way to do it reasonably, at least for us.